There is a reason why so many people are opting for refractive laser eye surgery: it really can improve eyesight, and in many cases drastically. 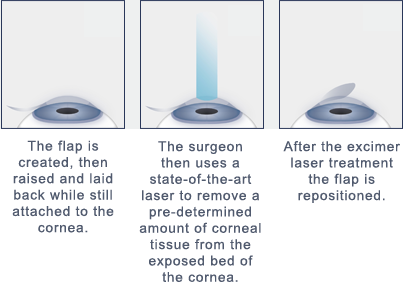 Refractive surgery provides a number of very important advantages. There is typically little or no post-operative discomfort. Recovery is fast and complications are extremely rare. Vision returns quickly, usually without the need for glasses or contacts. The LASIK (Laser Assisted In-Situ Keratomileusis) procedure combines the cool beam of an excimer laser with the skill of a surgeon to correct common refractive errors such as myopia (nearsightedness), hyperopia (farsightedness), and even astigmatism. LASIK gently but effectively reshapes the cornea, one of the primary focusing mechanisms of the eye. When one is nearsighted, the cornea is too steep and light does not focus correctly onto the retina. LASIK flattens the cornea, so light may focus correctly. When one is farsighted, the cornea is too flat and light does not focus correctly onto the retina. In this case, LASIK steepens the cornea, so light may focus correctly. Prior to LASIK surgery, numerous tests will be performed on your eyes to determine the amount of correction needed. A computer, controlled by your LASIK eye surgeon, is used to precisely calculate the exact amount of cornea that needs to be removed for each person's individual eyes.